It’s The Fugitive meets Inception, with a futuristic chase story that turns into a thrilling mystery. Minority Report is a pretty terrific movie. First off, it’s got probably the coolest representation of the future of any movie in recent history. This is a future where everybody has an eye print on record that can be scanned instantly so that as you walk down the street or into a store, advertisements play just for you and your specific likes. It’s a future where the police ride around in mini-jet helicopters and have rocket backpacks that allow them to fly. It’s a future where cars drive by themselves, sliding around on a magnetic track while you just sit there in the back seat and relax. And it’s a future where the police now run a program called Pre Crime, in which they try to see the future and what crimes will happen before they happen. This leads into the essential storyline of the film. PreCrime is a division of the police geared to stopping murders. The way it works is there are three PreCogs (for precognition), who lie in a pool of water as their thoughts are electronically interpreted. And they see the future. They see who is going to murder whom. And then two wooden balls get shot out to the police, one that says the name of the victim and the other that says the name of the killer. The police also get a record of the date and time of the murder. And that’s it. All they have to go on is that information, and also the visual images that the PreCogs saw, which have been projected onto video playback. Tom Cruise plays John Anderton, one of the head detectives in the division. Anderton is a pro at working the system, and the first part of the movie introduces us to everything about it. Anderton interprets a PreCog message, stops a man from killing his wife, and even meets a new guy who is investigating the way PreCrime works for a higher authority (either the FBI or the Senate or something). This new guy, Danny Witwer, (Colin Farrell) is the audience representative in the fish out of water scenario. At least until we get a grip on what PreCrime is all about. Anderton and his team explain to Danny the way everything works and while it is being explained to Danny, it is also being explained to us. I remember when I was watching Inception, feeling like that movie applied the same initial formula as this one, where the main character is an expert on the system (DiCaprio), but then a new character is brought in to learn it (Ellen Paige), and while it is being explained to her, it is really being explained to us, the audience. While showing Danny the PreCogs, taking him down into their “temple,” the room in which they lie in water, one of the PreCogs (the female, named Agatha), grabs Anderton and asks him if he can see. Images of a woman being murdered are projected onto the screen, for what Agatha is seeing, and Anderton even knows who the woman is. And so he leaves the PreCrime layer and goes to the prison housing department where Tim Blake Nelson shows him how things work down there and tries to answer his questions about the woman in the video. Anderton later goes to his boss, the great Max Von Sydow (also great recently in Shutter Island), and tells him about Agatha’s vision. Right now there is one mystery on the table. What did Agatha want Anderton to see about this murdered woman. Anderton is about to get another one and it’s one that will shake up his world entirely. Another message is projected out from the PreCogs and this one shows that Anderton, himself, will be the one committing a murder. He can’t believe it, especially since he has never heard of the man who will be the victim. But he goes on the run, nonetheless, and now the movie becomes a sort of version of the Fugitive. Especially since Anderton is not just running from the cops, but also trying to put the pieces of the puzzle together himself, convinced that he is being set up. Like that Harrison Ford movie, he is both running, and also playing detective, trying to prove his innocence. We’re about halfway in now and we get a series of great chase scenes. First, there’s one on the streets in which those jet packs the police wear really come into play. Anderton rides on the back of one of the officers and uses the man’s jet pack to travel down the roads, speeding above the ground like a hovercraft. And after he goes crashing through a few walls and is done with this police pursuit, he meets Danny’s team in a car factory. There’s another great action scene that takes place there as guns that shoot sound waves into the air are used and cars are being mechanically built all around them, sometimes even right on them. After all of this action, it’s time for some more investigation. 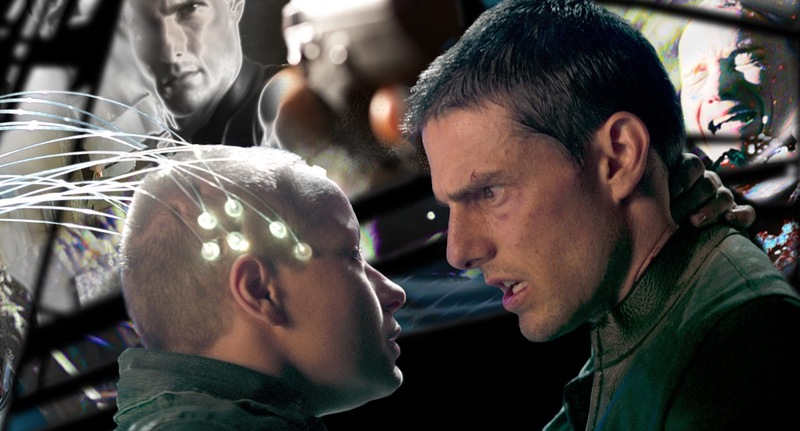 Anderton goes to meet the woman who invented PreCrime and learns about something called a “Minority Report,” which is when the Precogs disagree about their vision. 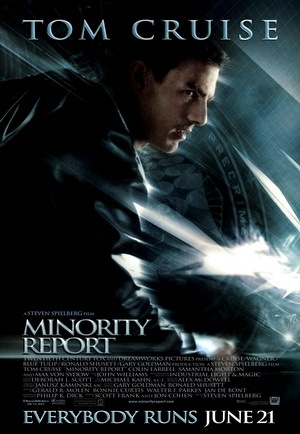 They don’t always see the same thing, and when this happens, a Minority Report is issued. Anderton is hoping that one of these exists for him so that he can prove his innocence. Only the Minority Reports are stored inside the PreCogs minds so that the only way to see one of them is to have access to one of the PreCogs. In order to even think about going near the PreCrime building and getting into the temple and near the PreCogs, Anderton needs new eyes. I love how the movie thinks of things like this and takes the time to show us how he would go about getting them. He needs to have an illegal surgery by criminal doctor Peter Stormare (a man who Anderton once put behind bars for doing illegal surgeries and burning his victims). The eye surgery sequence is pretty great, especially afterwards while Anderton is just waiting around, with a bandage over his eyes, waiting a number of hours until he can take it off. That’s when the police show up at his building, throw out some electronic eye-reading spiders, and try to find Anderton. As the movie goes on, more and more questions get answered. There’s a moment in the film where a main character dies that always reminds me of the scene in L.A. Confidential where Kevin Spacey meets his end. That’s because of the way he dies, the way he has uncovered certain information, and the character who kills him. It bothered me how close this part was to L.A. Confidential the first time I saw the movie, but then I realized this is what great movies do. They borrow in little bits from other movies. And if they copy the ideas of just one scene, it’s really not such a big deal. Instead, the focus here is much more on all of the futuristic things going on everywhere you look, and also the two mysteries. The first is what that woman who was killed in Agatha’s vision has to do with anything, and the second one, of course is about Anderton killing this man who the PreCogs say he will kill. In a lot of ways this movie also reminds me of a futuristic Double Indemnity with the main character being the head of the police division that ends up coming after him. It’s one of those situations like Inception where he knows all of the tricks of the trade, and never sees any surprises and now suddenly the tables are turned on him. The movie is pretty amazing. It has great action, smart and creative futuristic ideas, and a gripping mystery filled with clues and revelations. It’s Steven Speilberg’s best movie since Jurassic Park, which was in the early nineties, and an absolutely fantastic film.